Does your antiperspirant leave marks on your clothes? 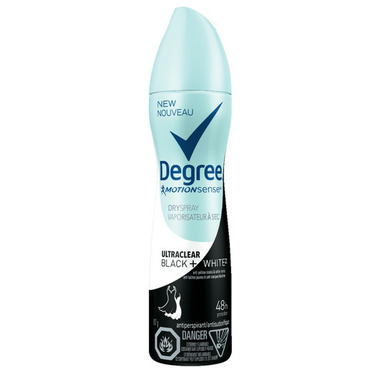 Degree Women® Antiperspirant Dry Spray UltraClear Black + White is specially designed to help keep your clothes looking new. With anti white marks on black clothes and anti yellow stains on white clothes. You’ll look great all day. Ingredients: Aluminum Chlorohydrate 20.2%, Butane, Cyclopentasiloxane, Hydrofluorocarbon 152a, Isobutane, PPG-14 Butyl Ether, Disteardimonium Hectorite, Propane, Parfum, BHT, Propylene Carbonate. I'd love to try this deodorant but it is so strongly scented (and not a pleasant scent at all!!!) that I can't wear it. Beyond the fact that scents make me feel ill, there are so many places now that don't allow people who are wearing scented products. So where is the unscented version of black white? Time to get with the times!